I am a professional dancer, Yoga instructor, editor, and writing coach specializing in the genres of somatics, wellness, and spirituality. A book I edited, Clearing the Path: The Yoga Way to a Clear & Pleasant Mind, by Stephen Parker, PsyD, is available through Ahymsa Publishers. I have also co-edited the newsletter of the Wisconsin Dance Council, contributed to the newsletter of the Milwaukee Ballet, written for the blogs of the Dance Exchange and Danceworks, and authored a feature article in Dance Studio Life Magazine. My Bachelor of Fine Arts degree in dance, Honor’s College degree, and journalism minor are from the University of Wisconsin–Milwaukee, and my RYT-200 certification is from YogaOne Studio in Cedarburg, WI. I have been a student of Yoga since 2008, a professional dancer with Milwaukee's Danceworks Performance Company since 2011, and a Yoga instructor since 2014. From 2013–2016, I worked at the UWM Writing Center tutoring student through faculty writers across disciplines. I love engaging in collaborative conversation and look forward to helping you discover and convey what you have to say! I believe that great writing, like inspired choreography or a carefully constructed Yoga sequence, happens when we catch our impressions and then test and refine them to create meaning and form. While editing, I hear each syllable the way I feel a dance’s rhythm, breath, and flow. I suggest pacing, section breaks, and narrative arcs that mirror the way I practice Yoga. Vinyasa means “to place in a particular way,” and I believe successful writing does the same. Intentionally crafted to convey a particular message, it dances between release and recovery, pose and counterpose. Valuable writing reflects editorial decisions on brevity versus depth, big picture versus small detail. Editing consists in carefully considering organization, development, clarity, and word choice to convey a unique perspective—in an author’s singular voice. Dancers often define our art by “what happens between the steps.” I believe worthwhile writing happens between bits of reported information. Anyone can write a report, but a skilled writer conveys information soundly and relates it to perhaps many other disparate ideas to discover something new. Innovative writing thus reveals itself to author and editor through a process of writing, questioning, and revising. It compels readers, relates to them, and leaves them better off: more knowledgeable, more skilled, more open in their minds and hearts, more willing to act. Writing is thus thinking, refined. It occupies the liminal space between idea and reality. It bears witness to who we are and impels us toward what we might become. 2. Consider the following . . .
What is your "take away" message? 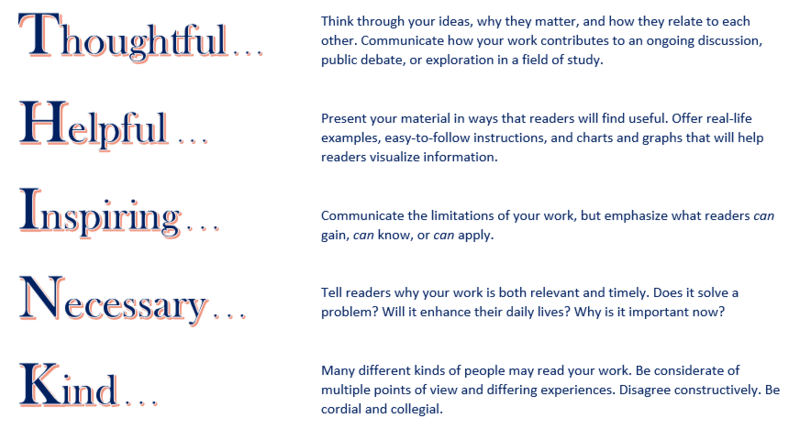 What must readers know to understand your work? To appreciate why it matters now? 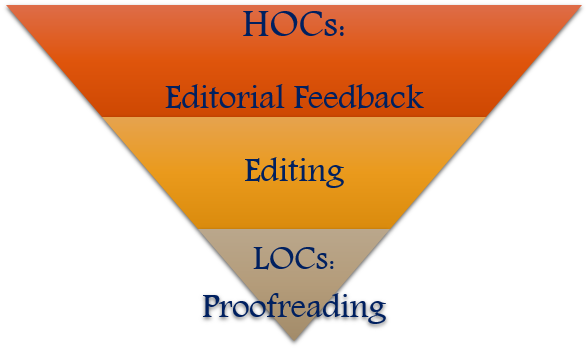 Per Writing Center pedagogy, I edit higher order concerns (HOCs: audience, purpose, context) before later order concerns (LOCs: spelling, grammar, punctuation). A favorite slogan at the UWM Writing Center during my time there was, "Every writer needs a reader." I encourage writers who feel their work is ready for proofreading to receive Editorial Feedback (see Services & Pricing).